For over 40 years the Eastern Indigo Snake (Drymarchon couperi) has been listed as a threatened species throughout its range in the southeast Coastal Plain. This magnificent species is America’s longest snake and is now only found in southern Georgia and peninsular Florida. Increasing pressures on Indigo populations include habitat loss, habitat fragmentation and the decline of Gopher Tortoise communities of which Indigos are strongly allied for use of their burrows as winter dens. Reduction of prey animals and an increase in predators (feral hogs, coyote, raccoons and fire ants destroying their eggs) also impact their survival. In 2008 The Orianne Society and partners embarked on a multidisciplinary approach to the recovery of this iconic species. 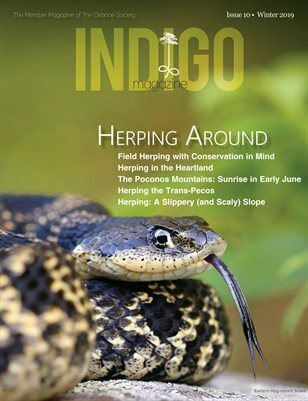 The combination of field studies and scientific assessments, a lands program focused on habitat restoration and creation of the Orianne Center for Indigo Conservation (OCIC) comprised a novel approach to Indigo Snake conservation. Opened in 2012 the OCIC, located on 25 acres in central Florida, is home to a Health Care Center, Herpetarium (indoor reptile facility), administrative office and support facilities. The OCIC is the premier and only captive breeding facility for the Eastern Indigo Snake whose mission it is to re-establish this threatened species into its former range. Originally created and established by The Orianne Society for the purpose of breeding Eastern Indigo Snakes for reintroduction programs, the OCIC is now operated by the Central Florida Zoo and Botanical Gardens. All buildings at the OCIC are specifically designed to facilitate a comprehensive approach to long-term captive breeding programs for Indigo Snakes and other snakes of conservation importance. Currently a colony of over 100 Eastern Indigo Snakes is managed for genetic and demographic diversity. Snakes produced at the OCIC are available for use as reintroduction stock in regions where historic populations have disappeared. To accomplish this noble vision and multifaceted undertaking, partnerships with nonprofit organizations and regulatory agencies combine both expertise and resources to reach program goals. Through partnership diversity, a far-reaching and comprehensive approach will promote success for snake conservation initiatives. Historically, captive propagation of the Eastern Indigo Snake has not been an easy task. Early studies in the 1980s at Auburn University found that both growth and reproductive rates of Indigo Snakes in the wild surpassed those of captive snakes. Compounding the problem was that after only a few years in captivity, female reproduction dropped dramatically. Clearly Indigos were receiving important physiological cues or other environmental advantages not traditionally found in captive environments. In order to establish a long-term reproductive colony, defining these crucial elements and how they could be provided in a captive setting had to be answered. To this end the OCIC has embarked on a nontraditional approach to maintaining Indigo Snakes in captivity that would promote reproductive health. Rather than attempting to replicate conditions found in the wild in an indoor setting, we approached the problem early on from an environmental perspective. The result was the construction of sophisticated outdoor snake enclosures which would offer exposure to all the natural conditions and seasonal cycles found in the wild. The OCIC is located in the center of historic Indigo range and is able to offer natural environmental conditions to its inhabitants. The most important element in our outdoor enclosures is the opportunity for thermoregulation (the ability of an organism to keep its body temperature within certain boundaries, even when the surrounding temperature is very different) with year-round access to underground bunkers. In the summer these “dens” provide cool retreats from the mid-day sun, and during cold winter months, the dens are heated to replicate temperatures that Indigos commonly seek in Gopher Tortoise burrows. In addition to matching the thermal conditions found in nature, snakes also have the ability to bask in the sun and receive the benefits of ultraviolet radiation, important in calcium metabolism. This could prove vital to appropriate circulating blood calcium levels, egg shell calcification and smooth muscle contraction associated with the egg laying process. Seasonal weather changes and temperature cycles also support normal physiological rhythms in temperate snakes which may be crucial to long-term reproductive success. Exposure to these climactic elements year round may promote essential physiological changes not previously appreciated. Increased opportunities for physical exercise and behavioral enrichment also supports the psychological well-being of snakes maintained outdoors. Our first set of 12 outdoor enclosures were completed in the summer of 2012, and many of our successful breeders are entering their third winter of being maintained outdoors. An additional 16 enclosures are currently being completed via a matching grant awarded by the American Zoo Association (AZA) Conservation Endowment Fund. These 28 outdoor environments house the primary members of our adult Eastern Indigo Snake reproductive colony. The largest challenge to establishing programs for endangered and threatened species is genetic diversity. Often populations of wild animals become genetically “bottle-necked” as their numbers drop and populations become isolated. To overcome this problem, the OCIC fortuitously linked with a developing reintroduction project for Conecuh National Forest in southern Alabama. Permitted by the Georgia Department of Natural Resources (GADNR), field collection took place in southern Georgia over a four year period (2008 to 2012) as a joint partnership of The Orianne Society, Auburn University and the Alabama Heritage Program. Following capture, female Indigos were maintained at Auburn University until oviposition (egg laying) and were then returned to the wild at their previous point of capture. The OCIC received at least one individual from 18 clutches during this time. This strategy provided an impressive genetic diversity in which to develop our Indigo colony. These captive-hatched Indigos were raised at the OCIC for our future reproductive colony while Zoo Atlanta raised an impressive number for the Conecuh reintroduction program. During the summer of 2014, the OCIC hatched 67 Eastern Indigo Snakes, a record not seen previously anywhere. This cohort was the result of breeding 10 female Indigos with non-related males. During the fall of 2014, 16 females were bred, so expectations are high for the 2015 hatch! This success has allowed us to now establish a second reintroduction site in the Florida panhandle. With the Conecuh program in its fourth year of releases, this new site will help fortify a region where Indigos have largely disappeared. Reintroductions are guided by the Eastern Indigo Snake Reintroduction Committee, comprised of partners and stakeholders involved with Indigo Snake conservation. The committee’s direction and support will help insure success in a multidisciplinary approach for Indigo conservation. OCIC staff also maintain the Eastern Indigo Snake Studbook and manages the Species Survival Plan for the Association of Zoos and Aquariums. This zoo population serves as education ambassadors for Indigo Snakes and other imperiled species of the upland ecosystem. The OCIC remains eager to work with partners to achieve the long-term vision of restoring robust Indigo populations across their historic range. At the OCIC, original research promoting long-term individual health and reproductive viability will be key to consistent future success. Further scientific studies will be identified to evaluate and understand the interplay of environmental and neuroendocrine control of reproduction, along with a better understanding of Indigo social behavior, blood values, hormonal influences, thermal biology and energetics, and nutrition. Financial support of the OCIC through the Central Florida Zoo and Botanical Gardens will help us achieve these crucial goals.